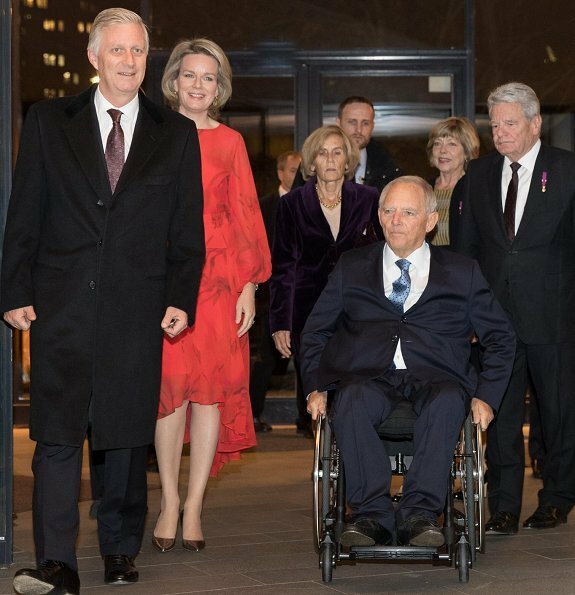 On November 23, 2018, King Philippe and Queen Mathilde of Belgium visited Berlin city of Germany to attend commemorations regarding the 100th anniversary of the end of the First World War. 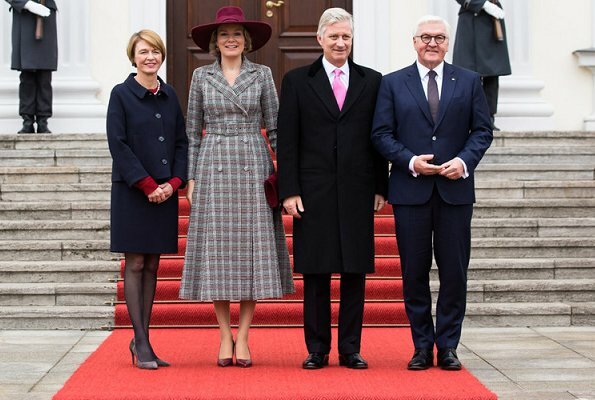 Belgian King and Queen were welcomed by German President Frank-Walter Steinmeier and his wife Elke Büdenbender at Bellevue Presidential Palace. 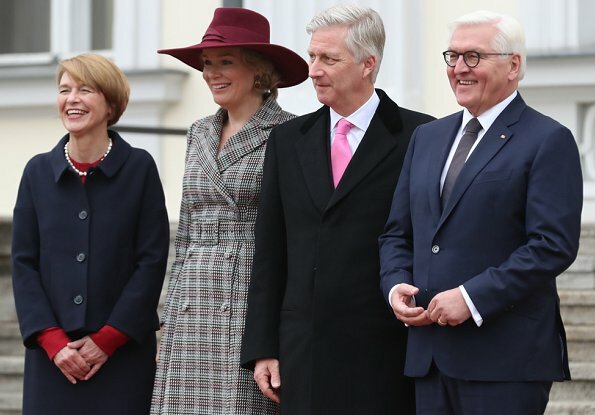 The King and Queen visited Berlin City Hall in the afternoon and laid a wreath on New Guardhouse (Neue Wache) Monument to commemorate the victims of the war. 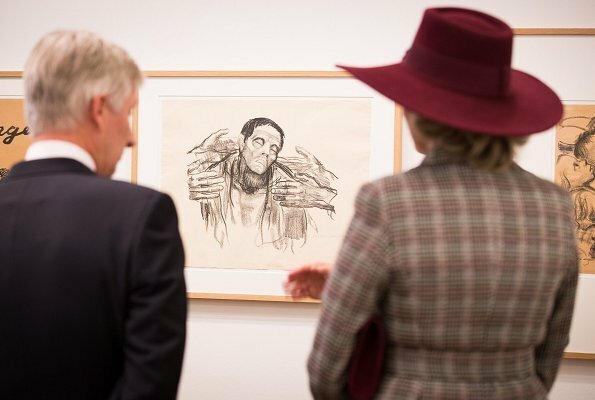 Afterwards, the King and Queen visited German Historical Museum. 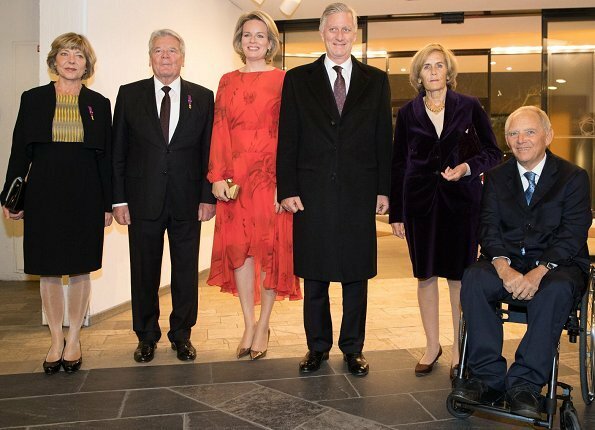 In the evening, King Philippe, Queen Mathilde attended a concert held at Berliner Philharmonie. This dress coat is really becoming for Q. Matilde. The lenght is perfect for her height, better than the short dresses she usually wears. A good novelty. I, too, like the look, the length, the fabric, and the silhouette of the coat dress. It is so much better than the red coat she wore the other day. The tailoring is well-done, matching the plaid all around. It must have been fun to deal with THAT. Her hat's color is perfect but she is lost under the big brim, I think. Yes, the king's brilliant pink tie is startling, but he seems partial to weirdly-colored things. His colorful pants while on vacation are something else. Kings can please themselves, I imagine. What is up with the bright pink tie the King is wearing? The Queen is wearing fall colors and his choice clashes with everyone around him. ik vind de jas heel mooi maar onderaan te breed. ik bedoel; jas is mooi maar onderaan te breed. This dress is just ok for me. I like the fabric but it would have been more flattering if it were straight instead of A-line. The hat is way too big, something smaller in the same color would have been better. Great coat. Gives off serious Melania vibes. The hat is nice with the contrast colour. Minor quibble- the hat band should go. The combination of this hat with this coat doesn’t work for me. Separately the items are great and on trend, just not together imo. For today's Berlin visit this dress is perfect,also love the hat ,shoes and bag combo. The coat/dress is much too long and hat too big.Not a good look at all for her age. 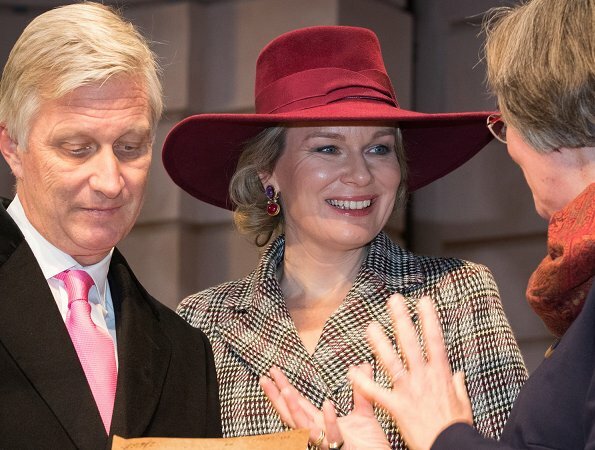 She is giving Maxima some competition in the hat department. Yes, Diane, but it takes Mathilde many hours to make it to Maximas championship. 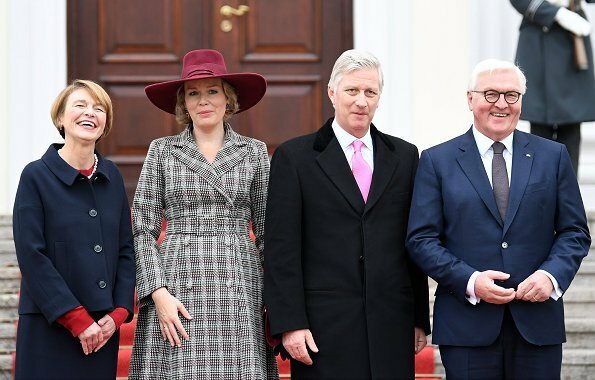 Queen Mathilde looks good in pillbox hats only. Her face and short hair do not suit to big hats . Makes her look fat,like the red coat/dress the other day, or maybe she gained some weight around the middle and hips. It is not becoming her IMO. And God forbid that she emulate Maxima with the big hats! Queen Mathilde has long legs and is "short-waisted" -- i.e. her natural waistline is a bit nearer to the bust than to the hips. So, her belt looks as though it is placed too high, while the skirt seems to go on forever! 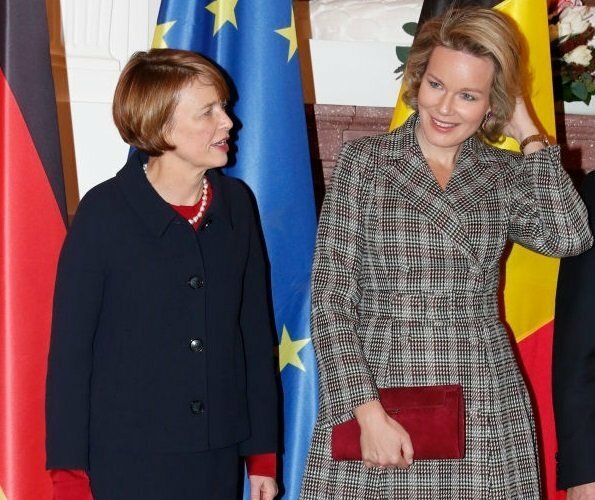 For this reason, I love to see Mathilde in dresses and coats that skim the natural waistline, rather than emphasize it. Gabriella is keeping her streak of negative comments going. I quite like the coat dress but can't help feeling the belt sits a little bit too high. Not sure about the hat - I think she looks better in hats with a smaller brim or no brim. Appropriately dressed for the season and the occasion. Without being too much but with personality. Elegant and dignified as always. 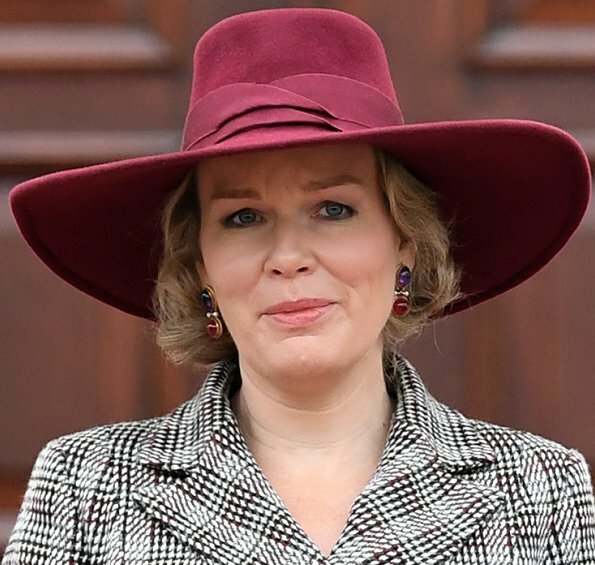 In fact, Mrs. Büdenbender looks fabulous, much better than Queen Mathilde, except the sleeves of her blouse or jumper being much longer than her navy suit. Otherwise an impeccable look of hers. The fabric of the dress is very nice, but there's just too much fabric, both in the dress and the hat! A more slim lined dress and smaller hat would have been much better. Agree. In fact this looks like a more 'mature lady' version of the Pedro del Hierro we saw earlier this week. I agree with those who think the coat dress is a smart and elegant look for Mathilde. The length is perfect and she is slim enough to look good in the wide skirt. 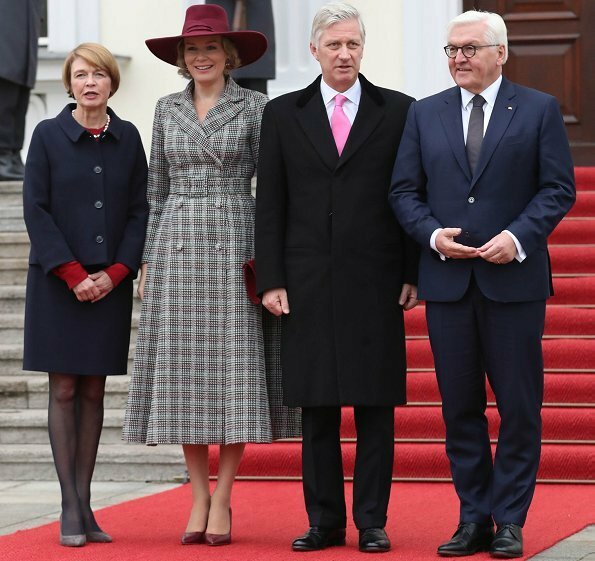 I also like the contrasting accessories and while the hat is big, she suits the colour and it doesn't overwhelm in the way that some of Maxima's do. She's a beautiful woman, but she had way better looks before. I share Southernbelle's puzzlement at King Philippe's bubblegum-pink tie. It looks silly, imo. Maybe one of his children gave it to him as a gift, and as a loving papa he feels he must wear it at least once...but will then allow it to find its way to the very farthest corner of his closet. Nie podoba mi się Królowa Mathilde w tym stroju. Kapelusz jest o wiele za duży, a płaszcz nie pasuje do jej sylwetki. 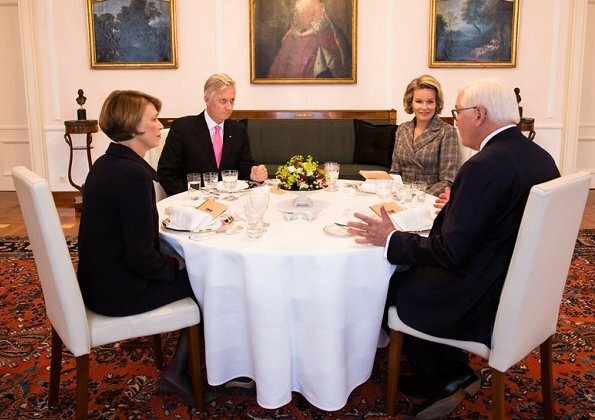 Seltsam - auf den Fotos vom Abend ist aber nicht Bundespräsident Steinmeier mit Partnerin zu sehen, sondern der frühere Bundespräsident von Deutschland Joachim Gauck mit Partnerin Daniela Schad. Altes Foto? Agree, these are older pictures from an older state visit. It is an actual picture. The former president and his partner had been invited as well, as had been members of the German government. The photos put up here are just showing some of the guests gather before the event. Ella y Melania Trump tienen muy alta la cintura. Y piernas interminables. También he notado su cara algo diferente.